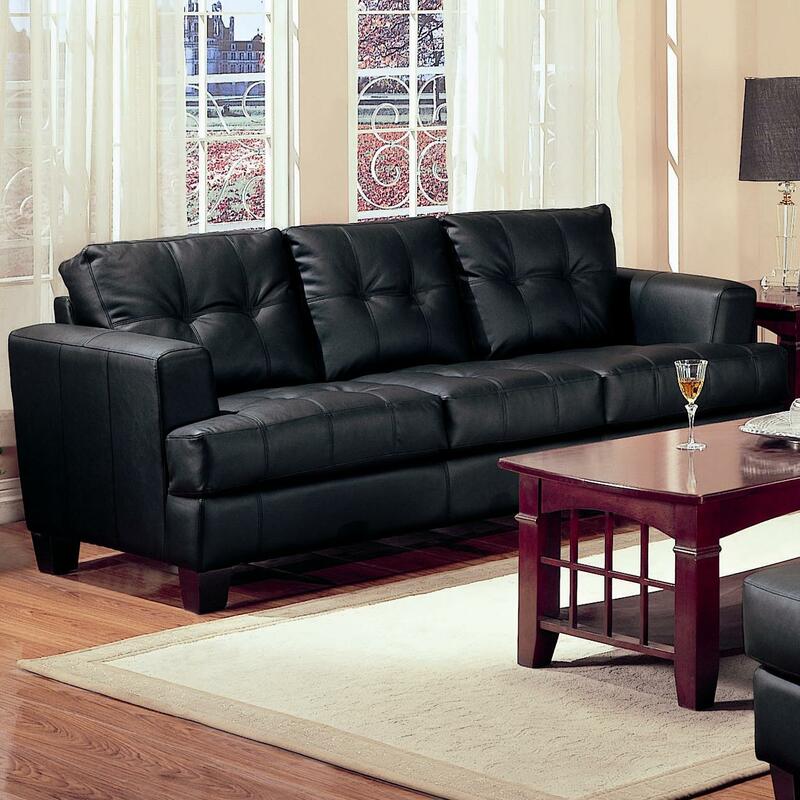 This contemporary bonded leather sofa will be a gorgeous addition to your living room. The plush modern tufted look back cushions, and deep seat cushions make this piece comfortable and cozy. Sleek track arms and square tapered feet finish the look. 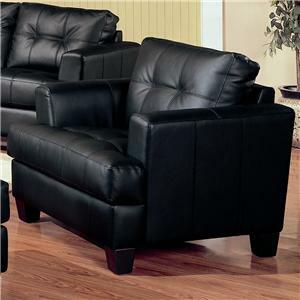 The sophisticated bonded leather is over a solid hardwood frame, webbed back, and sinuous spring base for support and long lasting comfort. 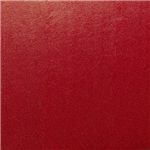 This piece will blend beautifully with your contemporary living room decor. 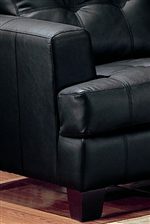 The Samuel Contemporary Leather Sofa by Coaster at Value City Furniture in the New Jersey, NJ, Staten Island, Hoboken area. Product availability may vary. Contact us for the most current availability on this product. 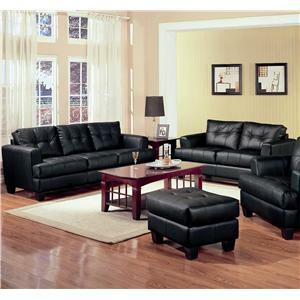 Fabric Options Sectional available in Chocolate and Cream bonded leather upholstery options. 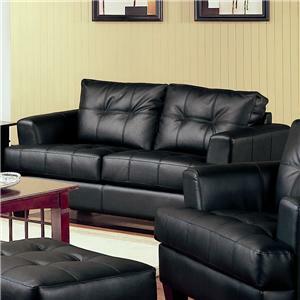 Other collection items available in Brown, Black, Cream, and Red bonded leather upholstery. Tailoring Clean tailoring with modern tufted look seaming details. Leg or Skirt Square tapered wood legs. Wood & Finish Dark wood finish on exposed wood feet. Frame Construction Hardwood solid frame. Seat Support Sinuous spring base. Padding & Ergonomics Pocket coil cushion. The Samuel group will give your contemporary living room a stylish update. 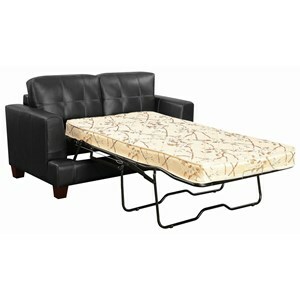 The pieces are crafted of sophisticated bonded leather, over a solid hardwood frame with webbed backs and sinuous spring bases for support and durability. These pieces feature plush tufted attached back cushions, and deep t-cushions on the seat for cool comfort. Sleek track arms and square tapered wood legs complete the look. 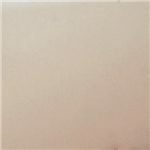 These simple pieces are easy to blend with your home decor, and will help you create the comfortable contemporary style you desire. The Samuel collection is a great option if you are looking for Contemporary furniture in the New Jersey, NJ, Staten Island, Hoboken area. 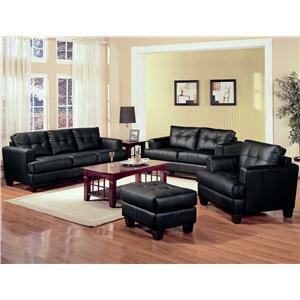 Browse other items in the Samuel collection from Value City Furniture in the New Jersey, NJ, Staten Island, Hoboken area.